Double Your Invisibility with Yo-Zuri H.D. Fluorocarbon Clear. Yo-Zuri H.D. 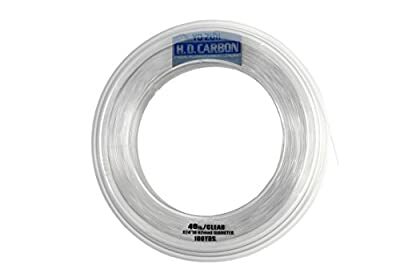 Carbon is a fluorocarbon leader that maximizes the advantages of fluorocarbon in a clear color to naturally blend under water. Fluorocarbon is virtually invisible in the water. Fluorocarbon is only invisible until it gets nicked or scraped. If this happens, that nicked section of the leader actually lights up from the sunlight becoming highly visible. Our specially formulated blend of fluorocarbon is extremely resistant to nicks or scrapes, giving you a stronger, longer lasting leader material.